Q: The imagery used throughout your work evoked glimmers of childhood memories, specifically “Punch and Judy” puppet shows. Would you talk about your use of this kind of slightly sinister iconography? A: I don’t really see my iconography as sinister, although I know some people do. I search the markets and bazaars of Mexico, Guatemala, and elsewhere for folk art objects – masks, carved wooden animals, papier mache figures, children’s toys – to bring back to New York to photograph and paint. Color is very important – the brighter and the more eye-catching the patterns are on these objects the better – plus they must be unique and have lots of personality. I try not to buy anything mass-produced or obviously made for the tourist trade. The objects must have been used or otherwise look like they’ve had a life (i.e., been part of religious festivities) to draw my attention. How and where each one comes into my possession is an important part of the creative process. Making this work is a long, complex undertaking with many facets. Finished paintings are always an idiosyncratic blend of reality, fantasy, and autobiography. Finding, buying, and getting the objects back to the U.S. is sometimes circuitous, but that, too, is part of the process, an adventure, and often a good story. Here’s an example. However, thanks to my good friend, Donna, whose Spanish was much more fluent than mine, the three of us brain-stormed until finally, Tomas had an idea. I could pay for the figures at a nearby hotel and in a few days when the hotel was paid by the credit card company, the hotel would pay Tomas. Fabulous! Tomas, Donna, and I walked to the hotel, where the transaction was made and the first hurdle was overcome. Working out the packing and shipping arrangements took another hour or two. This was a small village off the beaten track so boxes and packing materials were scarce. As we figured out the details, Tomas and I realized we liked and trusted each other, became friends, and exchanged telephone numbers. The store did not even have a telephone so he gave me the phone number of the post office next door, saying that when I called, he could easily run next door! Most wonderfully, the package was waiting for me in New York when I returned home from Guatemala. All of the objects were unbroken and in excellent condition. As I travel I am drawn to each of these figures because it possesses a powerful presence that resonates with me. It’s a mystery really. I am not sure exactly how or why, but I know each object has lessons to teach as it assumes various roles in yet-to-be-created paintings. Coming upon a new find I wonder, who made this thing? How? Why? Where? When? I feel connected to each object’s creator and curiosity leads me to become a detective and an archaeologist to find out more about it and to figure out how to most effectively use it in my work. The best way I can describe it: after three decades of seeking out, collecting, and using these folk art figures as personal symbols in my work, the process has become an enriching personal journey towards greater knowledge and wisdom. They are a vehicle for learning more about the world and and about myself. And what artist doesn’t love to learn? 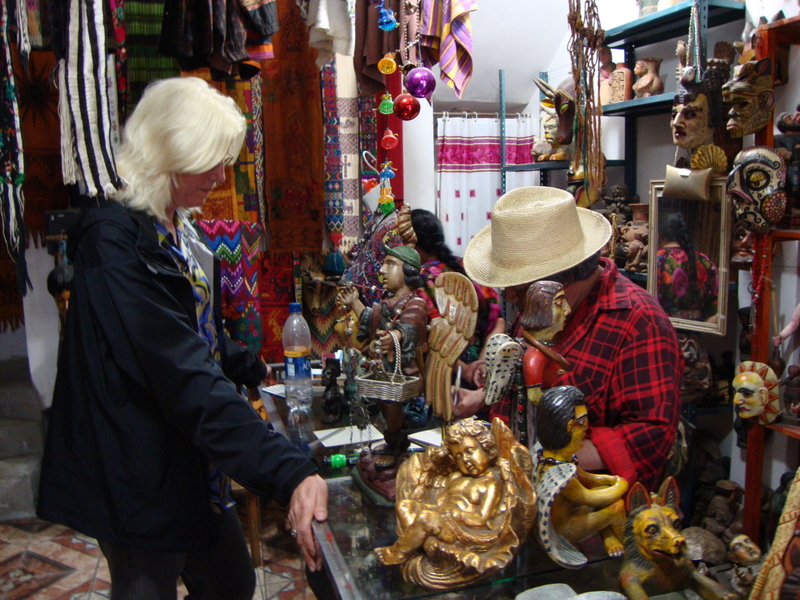 Posted on April 15, 2017, in An Artist's Life, Creative Process, Guatemala, Travel, Working methods and tagged "Punch and Judy", folk art objects, Guatemala, iconography, imagery, Lake Atitlan, Panajachel, Panajachelitos, Tomas. Bookmark the permalink. Comments Off on Q: The imagery used throughout your work evoked glimmers of childhood memories, specifically “Punch and Judy” puppet shows. Would you talk about your use of this kind of slightly sinister iconography?.